Original text and images of the 1985 BMX Schwinn sales brochure. 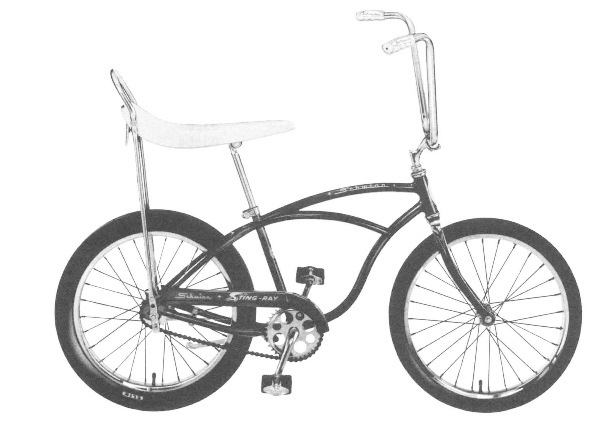 When it comes to BMX, nobody sells a better bicycle than Schainn, because nobody designs a better bicycle than Schwinn. All of the new Schwinn feature innovative engineering concepts that allow us to built BMX bikes with strength, durability, styling and performance from the ground up. You can see, feel and touch this quality by design in every BMX machine in the Schwinn line. Fast, responsive and tough, each represents the best dollar for dollar value in its class. Designing this kind of performance and value into a bicycle is no accidents. It's the result of thousands of hours of research, testing and refinement, both on the track and off. Ask a man who knows. Mike Poulson, Schwinn Pro and captain of the Schwinn Factory R and D BMX racing team, has won more races than most people have even entered. He knows as much about BMX bicycles as anyone alive. And he's done it all of Schwinn. Mike's expertise is the key to the innovative engineering of the new Schwinn BMX bicycles. From frame geometry, to component selection, to tire specification, Mike Poulson has given us winning racing experience so Schwinn could design a better bike. When the going gets tough, the tough win races. When a new design concept comes off the drawing board, the prototype parts are handed over the Schwinn Factory R and D BMX racing team for track testing (some people call it torture testing). Their job is to try out the new designs, thrash them every which way they can, and try to win races in the process. And nothing succeeds like success. Currently ranked among the top teams in the National Manufacturers Team Category, the Schwinn team has a tradition of victory. The Schwinn Team puts their bicycles to the test. The Factory Team's testing, along with Mike Poulson's input, tells us whether or not a new design is worth considering for our production bikes. Any design or component that can stant up to the team's thrashing should last longer on your BMX bicycle. And a race-proven idea will help make your Schwinn quicker, more responsive and stronger on the street or track. For example, the team has recommended aircraft quality 4130 chrome-moly tubing for racing bikes, Dia Compre brakes for others, and Sugino components for still others. You can find all these recommendations on many of the bikes in the Schwinn line - all race-proven and tested. We're sending the competition down the tubes. Schwinn h as always been miles ahead of other BMX manufacturers when it comes to tubing. Why? Race-testing and quality by design. The patented Schwinn bi-oval design tubing is acknowledged as providing the most metal to metal contact at each joint to absorb and distribute stress more evenly. Furthermore, our street and sport bicycles have been improved by using larger diameter tubing thus eliminating the need for frame gussets. And on out top of the line model, you'll fine the even more advanced "Tri-Caliber" tubing with three different thicknesses in one tube! 1.0 mm at the head tube joint for strength; 0.7 mm at the center to save weight; and 0.9 mm at the seat tube joint for more strength in that critical area. All the testing, research and innovation in the world are useless unless they can be used in real life. Schwinn understands that different people have different needs when it comes to BMX bicycles. That's why we offer a full range of sizes and styles of BMX bikes in a variety of price ranges. Whether you're beginner or expert, Freesyler or racer, young or old, tall, short or anywhere in-between, there's a Schwinn that's just right for you. No matter which Schwinn BMX bicycle you decide has the "right stuff" for you, remember: every bicycle is covered by the Schwinn 5-Point Protection Plan and the Schwinn No-Time-Limit Warrant, all backed up by a nationwide network of Authorized Schwinn Dealers. They are all proud to offer the entire line of state-of-the-art, track tested, race-proven Schwinn BMX Bicycles. That's quality by design - That's Schwinn. Every Schwinn bicycle sold is backed by your 5-point protection plan to assure your cycling pleasure with a minimum of problems. 1. We will expertly assemble your Schwinn bicycle so it is ready to ride at no extra cost. 2. Our remarkable No-Time-Limit warranty will protect your Schwinn bicycle. 3. We will fit your Schwinn bicycle to the rider for added saferty and comfort. 4. We will give your new Schwinn bicycle a free 30-day tune up. 5. We carry a full stock of repair and replacement parts and provide professional, factory-trained service. Schwinn No Time Limit Warranty. Schwinn will replace any defective part. No time limit. No charge except for dealer labor after 30 days, or after a year incase of defective frames. See your Authorized Schwinn Dealer. Expanding our enthusiasm for free style bicycles is the Free-Form BG. Brake cable concealed in fork blade helps prevent cable overhanging into tire. Designed exclusively for freestyling, the Potts modification helps keep front brake cable from getting twisted during cross-ups. A competition level bicycle for the novice or expert. With BMX 4 spider, designed exclusively for Schwinn by Sugino, with radical spiral graphics. Alloy sidepull with Teck IV lever, cable is lined for smooth performance. The same innovative spirit that pioneerd the Sting tri-oval patented design inspired Schwinn Engineers (with the help of Schwinn Pro, Mike Poulson) to develop the all new Black Shadow. Allows for a lighter, faster bike, yet maintains superior strength to weight ratio. Tougher and lighter, the best strength to weight ratio chrome-moly crank available. The Qualifier is the best entry level bicycle available. Features ligher, 1 1/8" x 1 1/4" chrome-moly main tubes that are found only on higher priced bicycles. Designed and tested by Schwinn's own factory Research and Development team. These tires offer maximum cornering and side load characteristics. Colored rim strips higlight the oval hole design. Our scaled down Predator has the dynamic looks and responsive handling needs to meet the challenge of young BMX riders. The Predator Gremlin is a great starter bike with BMX styling to look like the pros.